The readings today begin the celebration of the season of Advent. The reading from Isaiah expects the reign of peace when the word of the Lord comes from Jerusalem. The readings from Paul and from Matthew’s Gospel concentrate on the future-orientation which calls Christians to decide to live lives worthy of the light that is about to dawn. I thought there might be some point to reflecting on the reading from Isaiah. Two years ago I posted three homilies for the feast of Christ the King, which you can find here. The feast of Christ the King is designed to emphasize the central place of Jesus Christ in our lives. If in our time and society to speak of kings is a little odd, still there is no doubt that what a king was once to his nation, Jesus Christ is to each of us. This essay reproduces the paper I delivered at the first Salamanca Conference, on the nature and future of episcopal conferences, held in Salamanca, Spain, January 3-8, 1988. The interdisciplinary conference was convoked as a way of responding to the call made at the Extraordinary Synod of 1985 for a study of the theological and canonical status of episcopal conferences. Just some notes as background for tomorrow’s Gospel. It begins with the admiration being expressed by some people at the Temple in Jerusalem, with its “costly stones and votive offerings.” To which Jesus replies: “All that you see here–the days will come when there will not be left one stone upon another that will not be thrown down” (Lk 21:5-6). The Temple in question was the third on the site. 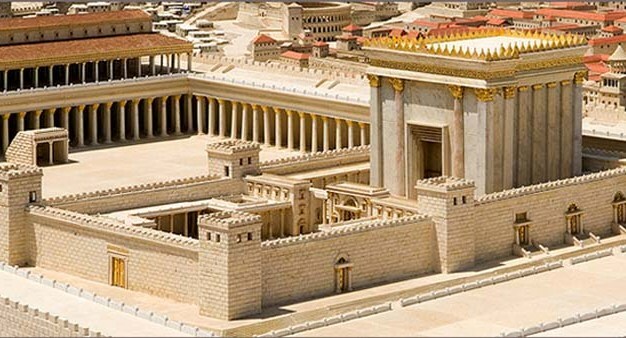 Solomon’s Temple had been destroyed by Nebuchadnezzar in 586 B.C. A second Temple was built after the return from Exile and completed around 515 B.C. Herod the Great decided it was not grand enough and embarked on a reconstruction of it that doubled its area. This work took decades, and in fact it was still under way in the time of Jesus. Completed about 63 A.D., it would be destroyed only seven years later. The exterior of the structure lacked nothing that could astound either mind or eye. For, being covered on all sides with massive plates of gold, the sun was no sooner upon it than it radiated so fiery a flash that people straining to look at it were compelled to avert their eyes, as from the rays of the sun. To approaching strangers it appeared from afar like a snow-clad mountain; for all that was not overlaid with gold was of purest white. From its summit protruded sharp golden spikes to prevent birds from settling upon and befouling the roof. Some of the stones in the structure were forty-five cubits in length, five in height, and six in breadth. St. Luke wrote his Gospel sometime around the year 85; he belonged, then, to the second or third generation of Christians. His writings reflect the wider perspective on the significance of Jesus Christ that the passage of time afforded him. He is the only evangelist to have written a second book, The Acts of the Apostles, telling the story of the journey of the Gospel from Jerusalem to Rome. And in both books, he found it necessary to alter the presentation of the Second Coming of Christ, in order to give positive importance to the time of the Church between Resurrection and Parousia. Our Gospel-reading today is one in a series of disputes between Jesus and his various opponents. Taken together, they illustrate and demonstrate his authority and wisdom as the Messiah. Each of them separately at once teaches something about the nature of the Kingdom he was announcing and calls his hearers to the conversion that alone gives access to it. The opponents today are the Sadducees, a more conservative group among the Jews, who, accepting only the first five books, the Torah, denied the resurrection of the just. The homey story they propose to Jesus was meant to point up the absurdity of that belief, and was probably borrowed from their disputes with the Pharisees, who took the resurrection so literally and uncritically that they could say, for example, that in the next life, “women will bear children daily.” Their argument takes the classic rabbinic form of quoting a single text, here about the obligation of a brother to marry his brother’s childless widow, and rigorously deducing conclusions from it. 31st Sunday of the Year – October 31, 1971 – Cathedral Parish, Portland, Me.